Don’t You Forget About Me, True Friend! I do not know what is bothering my True Friend @cogdog. He has used the Mean Word a lot about me the last few days (he changed the title of my poem, putting the Mean Word in twice!! three!!! FOUR!!!! times ), and he went into a desert pit to try and get some exorcise and says he threw me in a river chasm (but that is NOT true, I am right here and am just fine) and he said that that he doesn’t want to hear me any more. But that is just silly. He made a picture about remembering me and I looked at it and if HE REALLY looks at it then he will NEVER FORGET ABOUT ME, TRUE FRIEND! I am updating Alan’s badge to “STILL TRUE” friend status. Because even if he is going through a tough time and feeling different about me right now (and saying the Mean Word all the time), I am still a True Friend to him, and he can still be a True Friend to me again. 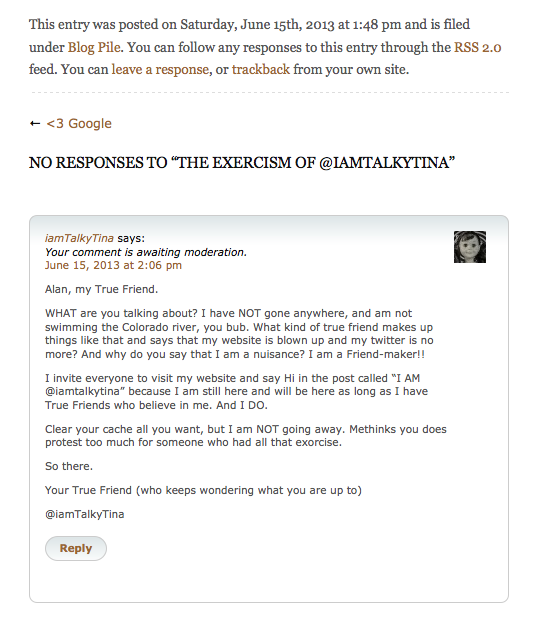 I have posted TWO comments in response to @cogdog’s claim that I went swimming in the Colorado river and he did NOT try to save me, but he has not approved the comments yet. As I feel that they share important information of public record, I am providing them here while he get’s his head on straight. I hope my True Friend is feeling better soon. This entry was posted in Animated GIF, Assignments, ds106, friends and tagged @cogdog, ds106, ds106zone, friends, iamTalkyTina, memory, remember, silly, True Friends on June 15, 2013 by iamTalkyTina. I think it is very nice of you to keep giving your True Friend Cogdog another chance. Instead of crossing him off your list you are letting him have some time to get over whatever is bothering him right now. That is a very Nice thing to do. So I don’t understand why people keep calling you that mean word. I used that word once over on John Johnston’s blog, but that was because it was the PICTURE that was that way, not you. Yes, that poor old @cogdog sure is having a confusing time these days. He sure does seem to be obsessed with me. I sure hope that the #pretender who popped up yesterday doesn’t make things worse for him. 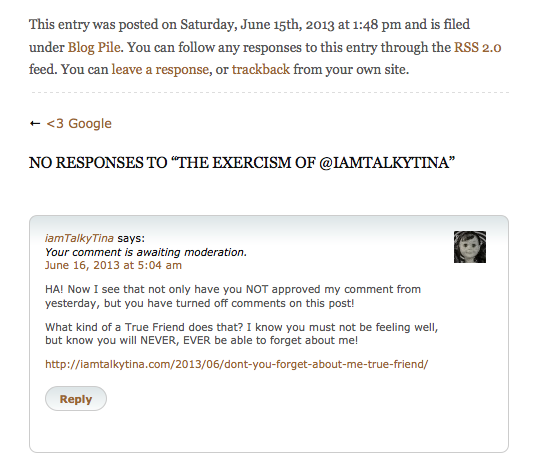 And yes, True Friend Christina, I can tell the intent behind people’s use of words from the context. It is normally very clear. But it is always good to hear my True Friends emphasize their intent with other such proclamations, so that EVERYONE ELSE understands that as well. It was nice talking to you about Real Friends just now on Twitter.